Marie Antoinette hadn’t even set her dainty little foot in France yet, and already she had a taste of the minute, stringent, sometimes absurd, rules of etiquette that would govern her life at Versailles. Before the official ceremony of handover, which was to take place in the isle of Kehl, in the middle of the Rhine and on the border between Austria and France, the Count of Noailles, the husband of the Countess of Noailles, whom Marie Antoinette would nickname Madame L’Etiquette for her zeal in making sure everything was done according to its rules, insisted on changing a few words of the document of the handover at the last minute. According to the Count, the phrase “Their Imperial Majesties having wanted [the marriage]” was offensive to the French King, and wanted it altered to “Their Imperial Majesties having been willing to accede to the King’s wish”. There had to be no doubt that it was Austria that had given in to the wish of the French, and not the other way around. In the end, there were to be two documents. In one, France signed before Austria, while in the other, the order of the signature was reversed. 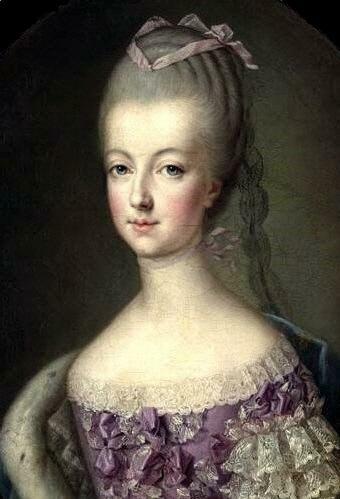 Then, Marie Antoinette was stripped of all her luxurious Austrian clothes, and made to don French garments. Now that she was Dauphine of France, she could retain nothing that belonged to a foreign court, not even the one that had been her home up until her wedding. Her Austrian clothes, however, didn’t go to waste. They were seized by the Dames du Palais, Marie Antoinette’s senior attendants, as perquisites of office. Parting from her clothes, however beautiful they may have been, was easy. Saying goodbye to her Austrian attendants, including her beloved pug Mops (although the Austrian ambassador would later negotiate for the arrival of the pet in France), was much harder. The young Dauphine cried at the separation and gave her attendants messages for the family she had left behind at Vienna. The ceremony itself went smoothly. Antonia Fraser describes it thus: “There were two entrances to the hastily erected building, and two exactly matching rooms, one for the Austrians, one for the French. Marie Antoinette was led from the Austrian room into the salon of the handover by Prince Starhemberg. Here a table covered in red velvet represented the boundary between the two countries. On the other side of it she found the Comte de Noailles, with two aides, awaiting her. A human touch was provided by his son, the eighteen-year-old Prince de Poix, who could not resist peeking through the keyhole from the French side to try to get an advance view of his future Queen. Speeches were made and the deed was done. It was time for the Dauphine to meet her French attendants. Here there was a slight hiccup which involved, once again, etiquette and the Noailles family. The Comte de Noailles was anxious that his wife should be handed into the main salon by a gentleman-in-waiting, which he maintained was her right, as opposed to merely walking into it. In order to achieve this, it was arranged that the salon door on the French side should be left slightly ajar, so that it could be nudged open by her heavy flowing skirts at the appropriate moment. Unfortunately this resulted in the door opening too soon. . .
Marie Antoinette was now officially French.